Concrete swimming pools are the best pools that money can buy but when it comes to repairs, like to the interior surface of the pool, the repair costs can get very heavy, very quickly. The interior surface of a concrete pool is a very dense mortar that is troweled to a water resistant smooth finish. The base layer, or structure of a concrete pool, is made from concrete and steel reinforcing. Concrete however is porous which means that water would leak out constantly. In order to limit this problem, a very dense mortar layer, called plaster, is applied over the entire interior surface of the pool. The plaster layer is a very dense mortar, which reduces water permeability, however troweling the plaster when it is nearly already hard, called a “hard trowel” is where the majority of the water resistance comes from. There is no such thing as a waterproof concrete pool – only varying degrees of water resistance. The only potential “waterproof” concrete pool would be one that has an interior surface entirely comprised of Laticrete backed tile which is a cementitious layer engineered to be fully water proof. Almost no residential concrete pools are all tile, and of the few that are all tile, very few (almost none) were installed using the Laticrete system. What does all this mean to you as a pool owner? It is important to understand some truths about how concrete pools work, how they leak, and what realistically you can do about it. If you have a concrete pool with an older or failing interior surface (plaster) then the information on this page will help you to understand what the concerns are, and what kind of repairs you can do on your own to limit or potentially eliminate the problem. Crazing – Crazing is a network of spider cracks that appear in concrete due to the contraction of the surface layer as the concrete cures. Since concrete shrinks as it cures the development of crazing will set in shortly after new concrete has been finished. This typically would appear within one to three days after a new plaster resurfacing. Most commonly the crazing will not be visible, or be only minimally visible when wet or underwater. Crazing will be most apparent when the pool surface is dry and you spray it with water. The miniscule cracks from the crazing will have a dark contrast when compared to the rest of the plaster layer. Crazing usually does not actively leak water although it will incrementally increase the rate at which your interior surface leaches water to the substrate layer. Since crazing cracks are so shallow they can almost not be detected by feel and are not something that you can patch over in your pool. To minimize crazing when resurfacing a concrete pool you want to apply the new layer well before any direct sunlight or heat touches the plaster. A 6 hour plaster project often would be started around 5 or 6 in the morning. This way by the time the heat of the day and the direct sunlight are on the pool, the plaster has been finished. Non structural cracks – A non structural crack in a concrete pool refers to a crack in the interior surface layer (plaster) and not through the concrete shell. There are many reasons that a crack might develop in your plaster layer however most of these would be from the initial placement of the plaster. Cracks that develop later in the life of the plaster are most likely to be due to a crack in the shell layer to which the plaster is bonded. A non structural crack in pool plaster that develops later in the life of the plaster will almost certainly be a result of a delaminated area of plaster. This could be from poor bonding of the plaster layer in the pool which allow pool water to access a pocket in between the shell and the plaster. Structural cracks – A structural crack in a concrete pool will present itself in mostly the same way as a non structural crack. For you, the pool owner, both look the same in that all you can see is a crack in the interior surface of the pool. There are a few different ways to differentiate between structural cracks and non-structural cracks in a concrete pool. The first is simply the location, length and depth of the crack. I would expect a non-structural crack to be smaller, narrower, shallower and shorter than a structural crack. Any crack that runs for more than a linear foot or two is highly suspect of being a structural crack. 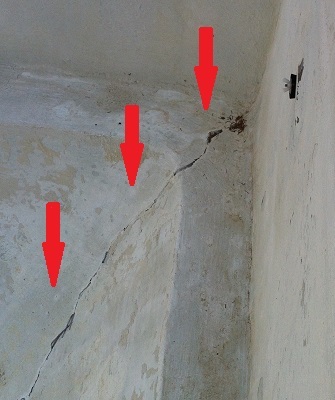 Typical symptoms of structural cracks might be crack that runs the width or length of the pool in any orientation, floor or walls, as well as any crack that segments an entire section of the pool such as a crack from the main drain to each of the deep end corners in the pool. Aside from visually inspecting the cracked areas to see if the crack continues past the plaster layer and into the shell, you can also try dye testing the crack to see if it is actively pulling water. If you need more information on how to dye test you can find this information in this pool leak detection article. If it is determined that you have a structural crack in your pool this is a very bad situation to have. Patching and new plaster will not stop a structural crack from leaking, or getting worse, unless the crack is no longer migrating. There are some rare cases where a pool will settle, perhaps due to a one time environmental event such as a leak or flood, and it will crack structurally but cease movement after cracking. If you have a crack that is completely stationary then you may be able to fix the leak with an inject-able urethane followed by a water stop concrete patch. 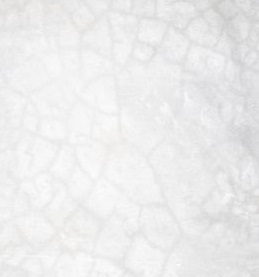 Delaminating – Since plaster is only around half an inch thick it is not very strong on its own. When applied over the concrete shell of the pool it must be bonded. 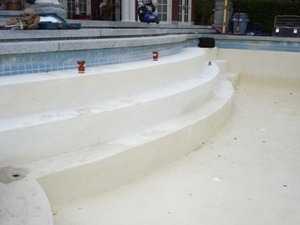 Bonding concrete involves removing all grease, oil and dust from the shell, and applying a bonding slurry over the concrete shell, and then plastering over this bonding layer. There are a number of things that can go wrong with this process that can result in the plaster delaminating, either right away, or within a few years. If the existing concrete layer is dirty, greasy or has any physical debris then this will certainly prevent a strong bond between the plaster and the shell. If the shell concrete is too dry when plastered this can also cause a delamination between the layers. If the bonding layer itself is allowed to dry too much before the plaster is applied over it then this could also cause a delamination. Finding delaminated plaster in a concrete pool is actually very easy with the only exception being that the pool needs to be emptied. Dragging any heavy tool such as a hammer, or heavy screwdriver handle over the pool plaster will reveal any delaminated areas. Any areas that are delaminated will sound very hollow, so much so that you would be hard pressed to not be able to tell the difference. Any plaster areas that sound hollow have already delaminated and will likely continue to crack and get worse unless you remove them and patch these areas.